This past week turned out great with the pantry challenge. I was able to use up quite a few things, and was actually able to re-stock some items. So, on week 1, we spent $11.50. We got some cheese and some 1/2 and 1/2. On week 2, which ends tonight, we bought more groceries. We spent $16, $18, and $4.50 at 3 different stores, totaling $38.50. I’m not sure how, but that totals exactly $50 for the 2 weeks, a nice round number. So, since I put $50 in an envelope twice, I now have an extra $50. I got lots of basics like celery, carrots, 1 head lettuce, 25 lbs potatoes, 4 tomatoes, 6 lemons, milk, 1/2 and 1/2, 6 bagels, 6 English muffins, 2 dozen eggs, onions, 40 tortillas, 3 apples, the bananas, and a few other things. I hit a Friday sale at a store near my house and got 2 bags full of groceries, plus the bananas for the $18. Rob did Cash and Carry for large packages of tortillas, onions, carrots and 1/2 and 1/2 for his $16 and the $4.50 was spent at a discount store. He went in there to get some gum for the kids in his classroom and found the fabulous deal on potatoes. 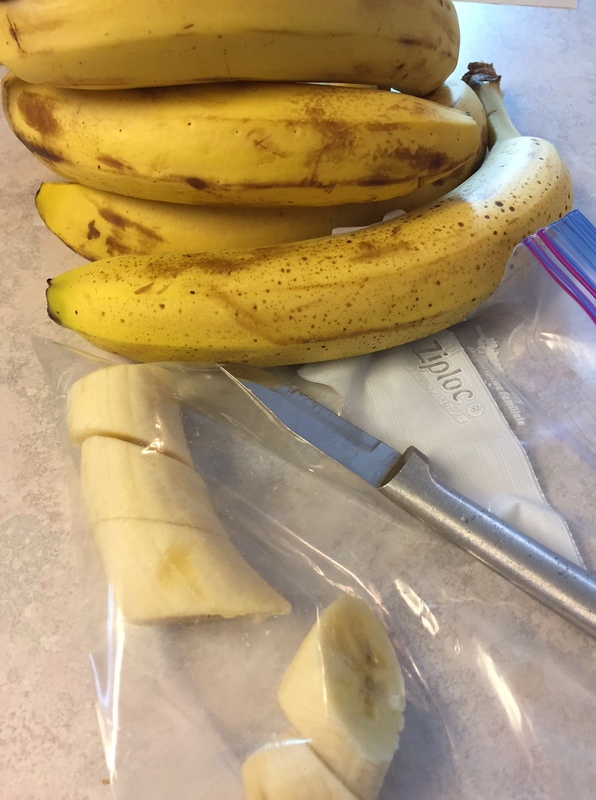 The items that were put back into the pantry were frozen bananas–there was a bag of very ripe bananas at one store for $2.28 and I got it. We ate a bunch and I froze a quart bag for smoothies. Rob came across potatoes for 50c for 5 lbs–10c/lb. I had him grab 25 lbs and am now wishing I had said 50! Meals: There were muffins, cereal, eggs, some bacon and sausage for breakfasts. When Jake is here, he eats bagels a lot. In fact, the entire bag I purchased on Friday has been eaten by him and some others. Lunches: I ground turkey with bread and butter pickles and Miracle Whip for sandwiches and we ate that several times. This was the end of a bag I found in the freezer. Rob always packs a lunch to work and he takes leftovers, sandwiches, fruit, crackers–whatever he can round up. He also takes coffee in a thermos every day. Patsy packs a peanut butter sandwich daily, and takes fruit, etc. as well. J and I ate a lot of soup, burritos and leftovers. I made rice and stir-fry on the day my mom came for lunch. Dinners: We ate a lot of turkey-rice soup, chili-mac casserole, chili, a lot of tacos/burritos and refried beans. We had pizza. We ate broccoli, green beans, baked potatoes, rice, and lots and lots of beans. Rob cooked some steak one day while I was gone. 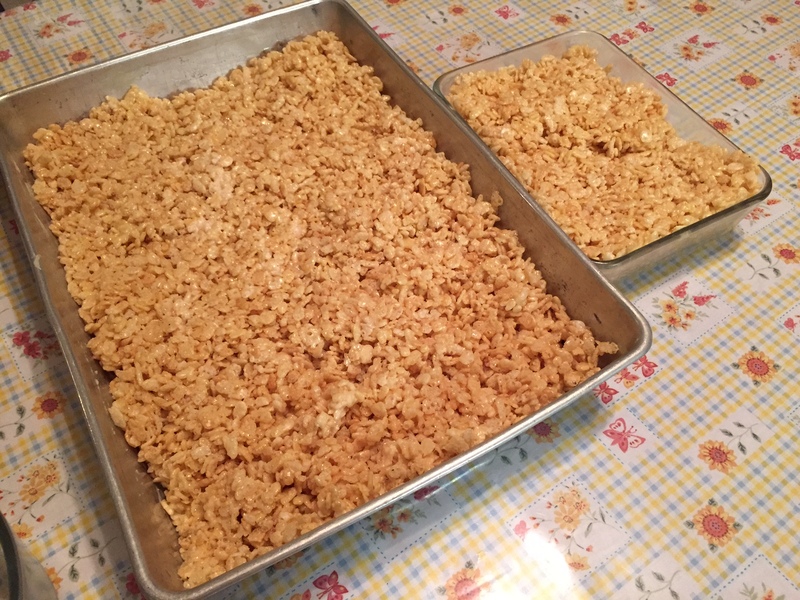 Extras: I made cookies and Patsy made Rice Krispie Treats for when we had company. We had popcorn and corn chips. We also used several odds and ends like partial bags of chips and crackers and the kids had some popsicles that were in the freezer. Items used: Canning: Several jars of home-canned items including peaches, tomato products, green beans, pickles, salsa, jam, applesauce, and more. Frozen: hamburger, steak, turkey from Thanksgiving, chocolate and white chocolate chips, butter, several kinds of peppers from 2015’s garden in re-fried beans, 3 chicken tenders for stir-fry, frozen corn from 2015’s garden, broth, bread, and more. We carried in several loads from the freezers in the shop throughout the week. I can start to see a little space in the freezers. Pantry: Several pounds of pinto beans, white rice, cereal, marshmallows, baking ingredients like gluten-free flour, sugar,cocoa powder, etc., spices for cooking such as chili powder and poultry seasoning, gluten-free noodles, coffee, tea, hot chocolate (packets), corn chips, popcorn, peanut butter and more. My point is, it all averages out. If I serve 15 meals per day for 7 days, I am serving 155 meals per week, plus snacks. I’m putting out ingredients for that many or more even though every one of us does not eat here every single meal. I am using lots of pantry ingredients, and spending very little money while still stocking up a little bit, so I’m feeling very successful. I’m making a dent in my stockpile, while still grabbing that great deal on potatoes. I have had to hold myself back from my usual habits of stocking up a lot when I find a great deal–but so far, so good. Thank you. 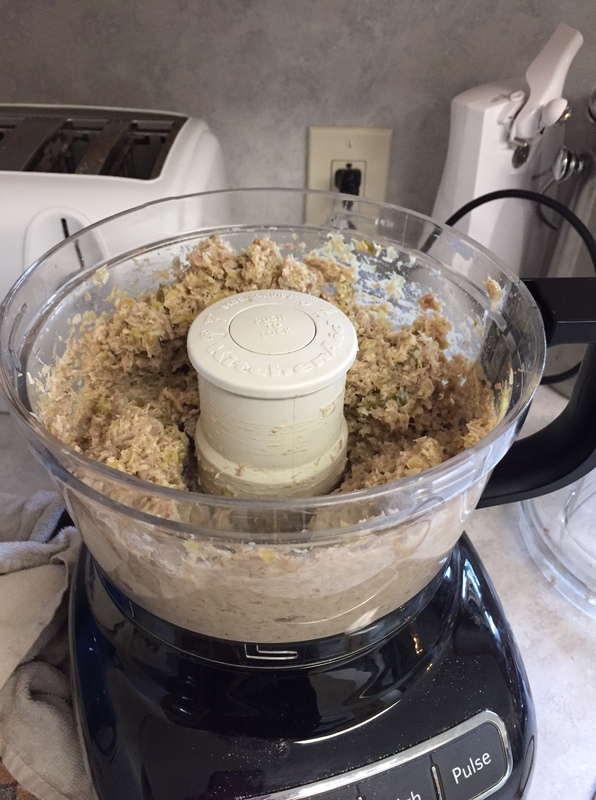 I hadn’t thought of grinding that turkey until my husband reminded me of it. When I was a girl, my mom always ground the roast beef on Mondays, after having the traditional pot roast for Sunday dinner. I loved it! I still have some lunchmeat that has been hanging around for a while, but it doesn’t expire for a while, so I thought I’d stretch it out with the ground meat. Now, as long as I don’t forget about it and save it too long……. I was raised on the ground bologna sandwich spread. Yummy. I haven’t had that in years. You’re doing great Becky! I think it’s kind of fun to “fly by the seat of my pants” when preparing meals. Of course, I don’t cook nearly as much as you do, so it isn’t stressful. I understand your post…. The kids would”eat or starve”.. We have a granddaughter [who is almost 16 now]. She has been sick most of her life.. and she literally eats only a few different foods.. People will say, ” if you let her get hungry enough, she will eat..” Well no… she won’t.. So.. We too.. cook special for her.. Papa really worries about her, we are eating Christmas feast with all the trimmings, and she will eat a chicken nugget.lol we agree, “Thank God for McDonalds..” smile. great buy on those potatoes…yea. It is hard to explain to people who have never lived with a child like this. They really WON’T eat. Michaela was starving herself to death when she was little until they figured it out. Yes, Merry Christmas with a chunky peanut butter sandwich, no jam or jelly, crusts cut off, topped with a chocolate chip Quaker granola bar……Hmmmm. But, it makes for a happy holiday. I went back for more potatoes today and now have 100 lbs. It was just too good of a price to pass up. I am enjoying this series very much. It helps me keep the right mindset. So, thanks for all your hard work here. I remember shopping at Costco when I had a full house. I’d only take a cart, not a flatbed. When the cart was full, I’d head for the checkout.I only bought food, tp and detergents there. I’d hope it would last three weeks! Ahhh, the joys of a full house with teens and young adults. My only saving grace was that my ‘stash’ of really good pantry items was never found by the kids. I shopped yesterday at one store and today will shop at another. Both do a 10% off everything day once a month. Yesterday’s store also price matches but only for two items for each sale. I kept to my list and got some great deals for the pantry. i wanted to add something about cooking ‘For One’. I use more prepared food now then I did when I had a full house. Biscuits in a tube, grated cheese, bread and jarred spaghetti sauce are the biggies. If I had to make everything from scratch like I did before, I just wouldn’t get it done and I’d resort to take out food which I can’t afford really. So using some ‘helpers’ is working for me, at least for now. That makes a lot of sense that you would use more prepared things. I have had lots of times when I figured that buying a prepared item would actually save me a ton for the same reason–I didn’t go out. And spaghetti sauce–sometimes it’s so inexpensive, it’s a crime NOT to buy it! I am noticing that this pantry challenge is taking a lot of work. This new house does not have a dishwasher, so I’m needing to wash all the dishes by hand after all of this cooking, which is taking quite a while sometimes. What’s saving my bacon is that I usually cook a bunch of things on the weekend and we eat the same thing over and over (like soup) or re-purpose it (like chili into chili-mac casserole) for the first part of the week. Then, later in the week, my schedule allows me to cook more. Thank goodness for microwaves! Oh, I am sorry you don’t have a dishwasher! That does make things much more laborious. When I have a bunch of things to hand wash I sit on a counter height stool and it gives me a chance to rest and saves my low back. I wish I thought of it a lot sooner. Pauline, that is so sweet for you to say, and extremely encouraging. Yes, there are times when we are down in the dumps. The changes haven’t been easy. But, it has been our goal to focus on the positive things and not stay grumpy for long! I so wanted to enjoy last summer, regardless of income or our disappointment, and we did!!! So, I’m happy about that. Thanks for reading. You did so well! The rubber really hits the road when you look at a week in terms of how many meals were made. I used to think of that and it made me feel weak at the knees when the kids were all home. 🙂 Hubby and I often grab quick meals out in a pinch too now that it is just us. And it is OKAY! It was a bit sobering when I added it up–it was a lot of meals, for sure. Right now, we are trying to strike a balance while surviving! I’m a little over-busy:) So, I do let myself grab something out in a pinch, as well, but try to keep it down. It can add up so quickly when you have a van full of kids! So, I also grab snacks, crackers, apple slices,baggies of cold cereal, even things like Capri Suns that are a little more expensive than my normal fare to keep people happy on longer drives, without needing to drive through anywhere. But then, there are the times when the clamoring is so loud in the back of that van that I cave in and just stuff those mouths with french fries! I have to not be too hard on myself and give myself grace when I don’t do everything perfectly. Sometimes I am my own worst enemy when it comes to expecting a lot from myself. Sorry to hear you don’t have a dishwasher. Have you thought of a portable dishwaher – one that rolls out of the way but hooks into the kitchen sink when running? I had a full size one at my house for years. It was a little heavy to roll around when fully loaded but worked great. Bought it from the Sears Warehouse scratch and dent section. It was new but cosmetically damaged. When I moved into my apartment, I bought an 18inch size one off Craigslist. Also works great. Just a thought- the portables save on both cabinet space, plumbing it in since it works off the kitchen tap, and runs off a regular plug. Again, really like this series. We really thought of a portable dishwasher, but there is actually no where to roll it to a place that is out of the way. There is no place like that:) It would be in the middle of the floor. This house is much smaller than our old one, so I’m still adjusting to that. But, I can sure clean it up quickly!!! Thanks for the comment on my blog. You made me laugh out loud about the chocolate. You had a great week. I can’t believe all the meals you made! And what a great deal on the potatoes! I did good on the challenge this week, only because Dustin came home for spring break and Joshua came and visited on his days off. I got to FEED AN ARMY AGAIN! It was wonderful. I focused on cooking meals just from my pantry and of course, my two bachelors were very happy. My grocery shopping was only fresh fruits and a few fresh vegetables. Mainly I used what was canned or what I had in the freezer. I did not get started working on my inventory, moving canned goods from the upstairs closets to the basement, neither did I succeed in only cooking for two (I had an army to feed), which is my main learning problem. Next week, they will be gone and I will try to focus on cooking less. Baby steps. I am taking baby steps. I love cooking for a crowd, too! It’s so much fun. Don’t worry. You’ll have plenty of time to practice cooking for less. I’m glad you enjoyed cooking for more. I have never seen it, but I checked and Netflix has it so it is saved in my list. The next time I have a moment, we will watch it. Why would anyone want to wear a dead fish? Guess I need to watch the show. It’s a movie about a man with some mental health issues–i.e., he can’t function very well because he’s worried about germs, etc. He puts his little goldfish in a jar around his neck (in water) and embarks on a journey to take the vacation the doctor recommends. So, the fish rides the bus, goes sailing, etc. It’s a comedy with Bill Murray in it, and is quite funny in places. The sad thing is that it mimics life all too well in others. The “Baby Steps” is his doctor’s “new” answer to all the problems of everyone, and the main character (Bob) goes around saying “Baby Steps” this, and “Baby Steps” that, over and over as he tries new activities. I won’t tell you how it ends in case you get to watch it. There is some bad language in a few parts. Otherwise, it’s a pretty clean movie. You are doing do well Becky! I still need to add up what I have spent. Things have been crazy around here and I have been on an emotional rollercoaster. Not a good combination. Things are starting to ease up a bit though so I am finally getting to visit blogs and comment again. Be blessed! I’m sorry you are having a rough time. It’s amazing you even can do a pantry challenge when you are feeling emotional! Sometimes that, and being super busy, make me get my eyes off of whatever little project I’m doing, due to there just not being enough brain cells for everything!!! Hang in there, and give yourself some grace. You will feel much better when they are gone! What a load off your mind. Well done with still having a $50 in your wallet! So, one of them noticed this past week because her favorite snacks ran out. She asked for more and I said I wasn’t buying any right now because I was trying to use things up. She immediately ran to her father and asked him to go buy more, since “mom was doing some kind of stupid grocery thing.” He declined, and she moved on to her sister, who did buy the snacks. Kids!!! It was really kind of funny, and she wasn’t as grumpy as it sounds in writing, but she definitely noticed the minute it inconvenienced her. I am curious….what is the snack she couldn’t do without? She wanted bagged snacks like Kettle corn, chips, etc.–I had purchased a couple of bags for very little at a discount store and she wanted me to buy several, as we usually do when we find a really great bargain. I bought 1 bag of Kettle Corn and 1 bag of “Food Should Taste Good” cracker/chips when I went back for the potatoes, for a whopping total of $1.29 for both combined. Normally, I would happily buy 3-4 bags at such a great price and she thought I should do that. Then, she thought for sure her dad would go stock up for her. When she got her sister to get snacks, she settled for chips–a couple of days had passed, and I think she “got” the idea that I just wasn’t shopping right now in the same way I usually do. Change is difficult for my crew. I’ve really said nothing to the kids except that I really need to use up things we have on hand to make room for new ones, which is correct. The whole thing was much more about me changing the way I do things than about any certain snack over another one. In her mind, we had used up the other ones, so we needed more:) I have noticed that we are using more popcorn than we do when we have chips in bags, which is good since we have a lot.